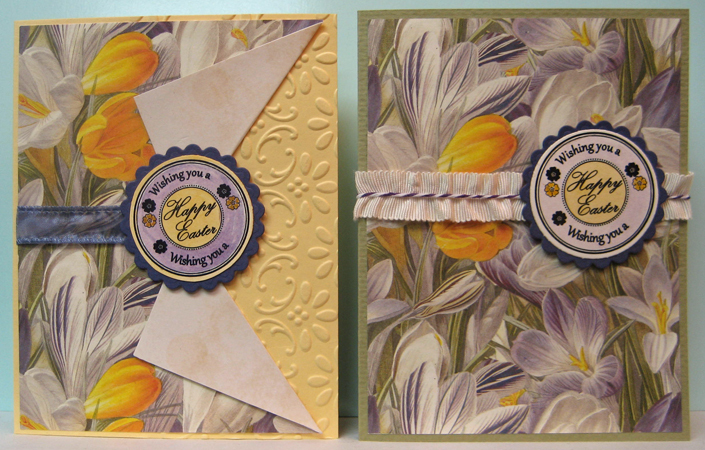 I love this crocus paper for Easter/spring cards!! This is almost the very last of the paper I have which has been my go to paper for these cards for many years!! Not sure if it is still available anywhere!! I may have to find a new favorite!! For my first card, I cut my background with a slit - 1 3/4" from the right hand side half way up and then folded the flap up. They were plain white on the back and I thought they needed a bit of something so I added little rectangles of a subtle patterned paper to make them more interesting. I like how it looks. Next time I will glue a strip of paper to the back before I cut the paper which will help to get everything lined up and create a nicer fold. I used a small piece of double sided tape right near the fold to keep the flaps open. I added a piece of purple ribbon from the folded area to the outside edge and adhered the ends to the back of the paper using double sided tape. I embossed (SU) the right hand edge of a yellow card and then added my folded background. I watercoloured my laser printed digital greeting, layered it onto a purple scalloped circle die cut and mounted it over the end of my ribbon using 3D foam tape. I added a bit of clear glitter to the flowers and the line on the greeting. For my second card, I used two small scraps and taped them together on the back to created a full background. I glued it to the front of a green card and added a ruffled ivory ribbon gluing the ends to the inside of my card with double sided tape. I created an opening on my spine using a slot punch by just punching off a sliver. I added some purple and white bakers twine over the center of the ribbon which worked out quite well. I used regular tape to secure the ends on the inside front. I watercoloured my laser printed punchie greeting and mounted it over the ribbon just a bit to the right as to not cover up the yellow crocus. Again, a bit of clear glitter was added to the greeting to give it a bit of fun! !